In the post about achsania, I mentioned the word for hotel - malon מלון. I didn't discuss the etymology there, so let's take a look now. Malon is a biblical word, originally meaning "lodging place" or more specifically "inn." It derives from the root לון, meaning "to lodge, pass the night." Klein points out that the formation of malon is similar to makom מקום - "place", which derives from the root קום - "to stand". There is also an unrelated homonymic root, לון - "to murmur." This is the root of the noun teluna תלונה - "complaint" and the verb התלונן - "he grumbled, complained." Klein writes that it might be cognate with the Arabic lama - "he blamed." Water to be used in matzah baking must be left to stand overnight (to ensure that it is allowed to cool). This water is then referred to as mayim shelanu (water which has “slept”). Rav Mattana taught this halakha in Paphunya. On the next day, the eve of Passover, everyone brought their jugs to him and said to him: Give us water. They misunderstood his expression mayim shelanu, water that rested, as the near homonym mayim shelanu, our water, i.e., water that belongs to the Sage, and they therefore came to take water from his house. He said to them: I say and meant: Water that rested [devitu] in the house overnight. A reader asked about the origin of the word daysa דייסה - "porridge, gruel." He said that "the word looks and sounds not much Hebrew and seems to hide its roots." Indeed, Klein says that the etymology is unknown, and other sources weren't particularly helpful either. But I think I found a convincing back story. Let's take a look. First of all, in Sokoloff's A Dictionary of Jewish Babylonian Aramaic, he defines the original Aramaic form, דייסא, as "coarsely pounded wheat or barley eaten or mixed with honey." Jastrow similarly has "a dish of pounded grain (wheat or barley), grit". The common element here is the "pounding", and in that light, the Ben Yehuda dictionary (under the entry dayis דיס, which I suppose was a new Hebrew form by Ben Yehuda that never caught on) suggest that the root would be an Aramaic root דוס, cognate with the Hebrew דוש, "to tread, thresh". (I must point out that I have not found the root דוס in any Aramaic sources that I checked, but that doesn't mean it's not out there somewhere.) So the pounding, threshing action on the grain, led to the name daysa - which can be viewed as a gerund. The root דוש, or the Hebrew noun disha דישה have a few other familiar related words. The passive form nadush נדוש, which literally means "threshed", has come to mean "trite, banal" - in the sense of "overused." Also related is the modern Hebrew word for pedal - davsha דושא, although the original Aramaic (as in Shabbat 81b) just meant "treading." This is a good example of modern Hebrew taking somewhat archaic Aramaic words and giving them new life in the revived language. 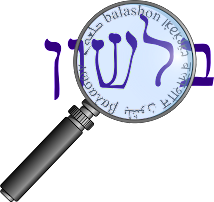 While the verb dash דש means "he tread", the abbreviation da"sh ד"ש is unrelated - it is an acronym for דרישת שלום - (sending) regards. However, just like porridge, it is best served warm - so you will frequently hear the request, "please send dash cham ד"ש חם!" We are approaching the holiday of Purim, where the megillah is read in most cities on the 14th of Adar, but in walled cities it is read on the 15th. One of the terms for a walled city is krach כרך. Until very recently, I would have told you that the origin of that word was fairly obvious. The root כרך means to "bind, wrap, surround." The binding of a book is kricha כריכה, and so an individual volume in a series of books is kerech כרך. In the Pesach seder we read about how Hillel would wrap his matza (clearly not the hard matza eaten by most Ashkenazi Jews today), maror and the sacrificial meat. That wrapping - which today we duplicate by eating matza and maror together - is called korech כורך. From here we get the official word for sandwich in modern Hebrew - karich כריך. So I assumed (as Klein writes) that a krach is so called because the walls surround it. However, I recently started studying the Talmudic tractate Megilah, and on the first page, Steinsaltz notes that a krakh is a large, generally walled city. He mentions the theory that it derives from the root כרך as we mentioned before, but only as the second possibility. The first possibility I had never heard before. mid-14c., carecter, "symbol marked or branded on the body;" mid-15c., "symbol or drawing used in sorcery," from Old French caratere "feature, character" (13c., Modern French caractère), from Latin character, from Greek kharakter "engraved mark," also "symbol or imprint on the soul," also "instrument for marking," from kharassein "to engrave," from kharax "pointed stake," from PIE root *gher- (4) "to scrape, scratch." Meaning extended in ancient times by metaphor to "a defining quality." 1540s, alteration of Middle English garce "a gash, cut, wound, incision" (early 13c. ), from Old North French garser "to scarify, cut, slash" (Old French *garse), apparently from Vulgar Latin *charassare, from Greek kharassein "engrave, sharpen, carve, cut," from PIE *gher- (4) "to scrape, scratch"
In this case, the foreign etymology of krach seems more convincing to me, although I'm sure most Hebrew speakers would find it difficult to believe. Perhaps to educate them, we can start calling the stake-like toothpick or skewer (used to hold a karich together) a karach?